The following article presents our review of the popular VPN app, VPN Unlimited. The app is a product of KeepSolid Inc. and was launched in the year 2013. The app is based in the US, which is a member of the Surveillance Alliance. This means that your data is not as safe as it could be with a VPN based in some other jurisdiction. A VPN, as you know, is a great tool that can help establish a secure private network even on a public WiFi or hotspot. What a VPN such as VPN Unlimited does is it establishes a point to point link where all data from the client to the server passes through a secure destination. VPN Unlimited also cloaks the IP address of the user, giving him a new virtual IP so he remains invisible to websites and apps he visits. The software uses strong AES-256 bit encryption, which guarantees military-grade protection from prying eyes who might happen to snoop on your data. Even in the event that they are able to acquire your data, they wouldn’t be able to decipher the same, rendering it useless for them. The power that comes with using a VPN such as VPN Unlimited is indeed unprecedented. It is precise because of this reason that VPNs are now becoming increasingly common in homes and offices as cybersecurity awareness continues to increase the world over. Let’s take a look at the basic features of this software before proceeding further with our review. Prominent Features Cloaks the user’s IP address; Easy to use; Personal IP, Personal server. Number of Servers 400+ high-speed servers at 70+ locations around the world. Logging Policy Does maintain log files though of session web traffic. Encryption Standards When using OpenVPN, the tool supports AES 128-bit and AES 256-bit encryption. IKEv2 uses AES up to 256-bit, Camellia 256-bit, and the ChaCha20Poly1305 encryption methods. Privacy Cloaks user IP but maintains logs of sessions: the total amount of web traffic and session dates. Device Support Windows, Mac, iOS, Android, Linux, Windows Phone, Chrome Extension as well as Firefox Extension available. Number of Devices Up to 05 devices free and up to 15 devices permitted on payment of additional charges. As you can see, the tool has some cool features but no special offerings when compared to the other competitors in the marketplace, which offer similar features. Of particular note is the private IP and server feature, which lets you use an IP/server all to yourself without having to share it with other users. This features comes at a premium price though but is a must for those wanting to really secure their networks from cyber attacks while benefitting from top speeds and bandwidth. Let’s see how the tool performs in our tests with streaming services. Clearly, VPN Unlimited works great with unblocking geo-restricted content on the streaming services. You’ll be able to access censored content such as original US Netflix series from regions outside the US. This certainly is great news for a major section of VPN users whose sole purpose of using a VPN is to be able to unlock restricted content. With Kodi, there’s no unblocking per se but having a VPN in place ensures that your browsing data is not leaked to your ISP. So, there you have it. A basic overview of VPN Unlimited, it’s pros and cons as well as the overview of the speed test and other such results, which will help you decide if this, indeed, is the best VPN for your devices. 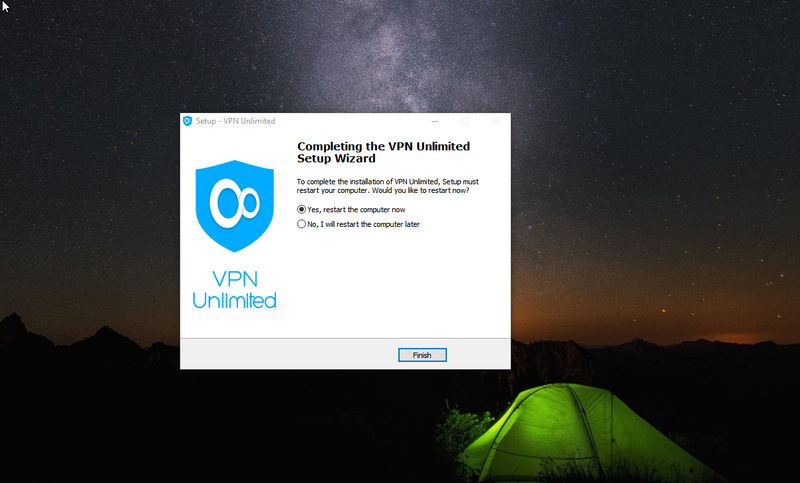 The following is an in-depth review of VPN Unlimited, which is based on our extensive tests of this software. Our tests span a multitude of parameters from installation and supported devices to speed tests, DNS Leak tests, and the software’s ease of use. We tested version 4.22 of this software on our Windows 10 machine and present the results of the tests in the subsequent sections. VPN Unlimited supports multiple OS platforms. A very versatile tool indeed! Our Score: 10/10. VPN Unlimited offers support for multiple OS platforms and has one version for your device no matter what OS you run. The tool supports Windows, macOS, iOS, Android, Windows Phone, Linux and even browser extensions- Chrome and Firefox. 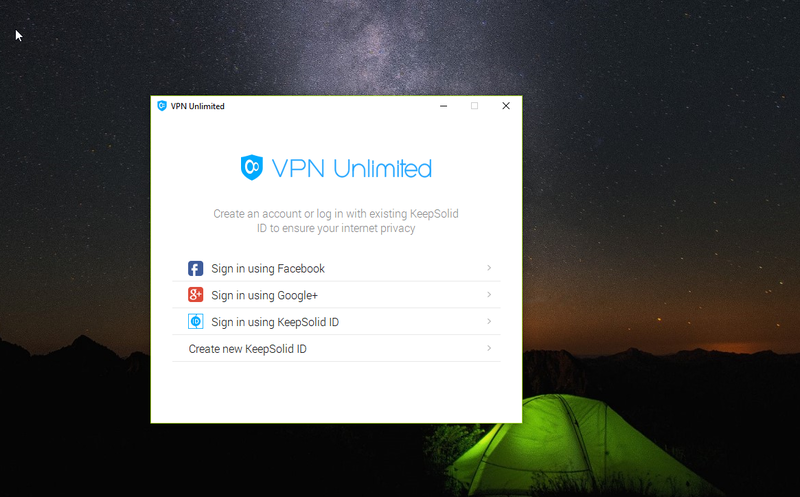 This is indeed the key to the power of VPN Unlimited, which supports a number of different platforms unlike other VPN many of which only support Windows, for instance. VPN Unlimited emerges as a true multi-OS VPN and stands out from the crowd, putting all other competitors to dust. The tool can be installed on 5 devices free of charge at a time and this can be extended up to 15 devices on payment of additional charges. VPN Unlimited is easily installed in a few minutes so you should be up and running in no time. Our Score: 10/10. VPN Unlimited is easy to install on a number of different devices and takes just a few minutes to set up. All you need to do is head to the VPN Unlimited official website and download the installer file. Once the download is complete, double-click on the installer file to begin the installation process. Follow the on-screen prompts and you’ll ultimately arrive at the screen shown below. Although you could choose to restart the system later, we highly recommend doing so now as to ensure all settings take effect. Once done, open VPN Unlimited. You’ll see the screen below, which will require you to enter your credentials to be able to log on. We highly recommend using a KeepSolid ID if you already have one or sign up for a new ID altogether. 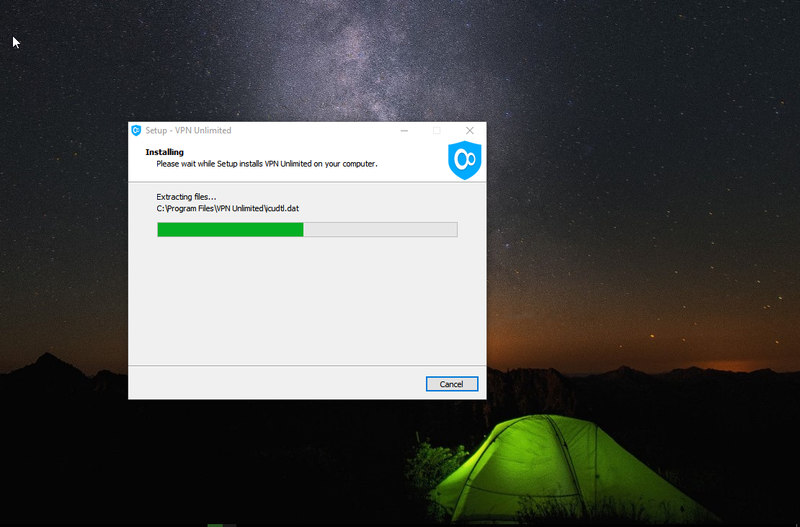 That’ all you need to do to complete the installation of VPN Unlimited on your computer. You can now proceed to open the tool to get started. 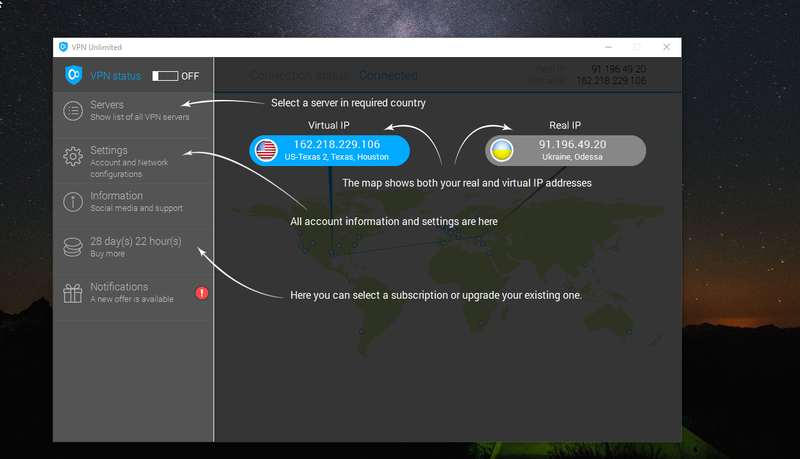 VPN Unlimited features basic VPN features with personal IP and Server. Our Score: 7/10. VPN Unlimited has all the features you might be looking out for in a basic VPN. Let’s begin with Total Security, which guarantees, as the name suggests, complete security. All data travels securely within a tunnel, which ensures that sensitive information such as passwords and credit card data, for instance, remains safe. The KeepSolid Wise technology provides for an additional layer of protection. Amongst the other tools are IP cloaking and fast speeds, as the tool claims online. The servers provide P2P (Torrent) support, which will come in handy if you’re downloading large files. 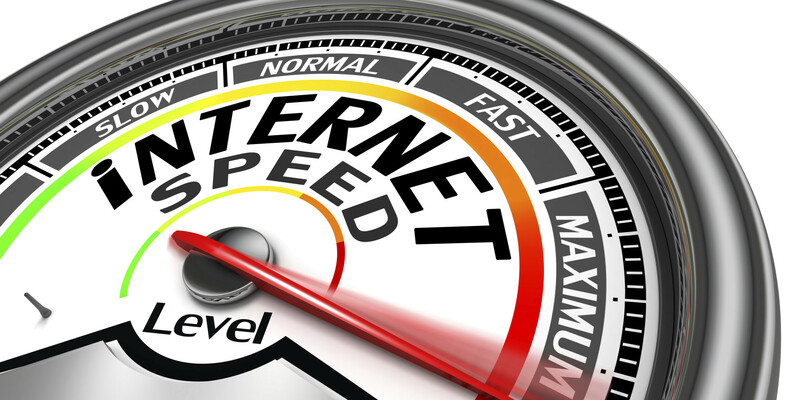 The unlimited bandwidth feature helps you surf the web to your heart’s content without any thresholds or limits set. As per the latest update, VPN Unlimited supports Kill Switch functionality in the Android Oreo and macOS versions. The feature is not available to Windows users yet, though. The kill switch is an incredibly powerful feature, which cuts off all network connections in the event that a VPN connection cannot be established. This helps prevent accidental data leakage. VPN Unlimited is easy to use. The UI is user-friendly. Our Score: 10/10. 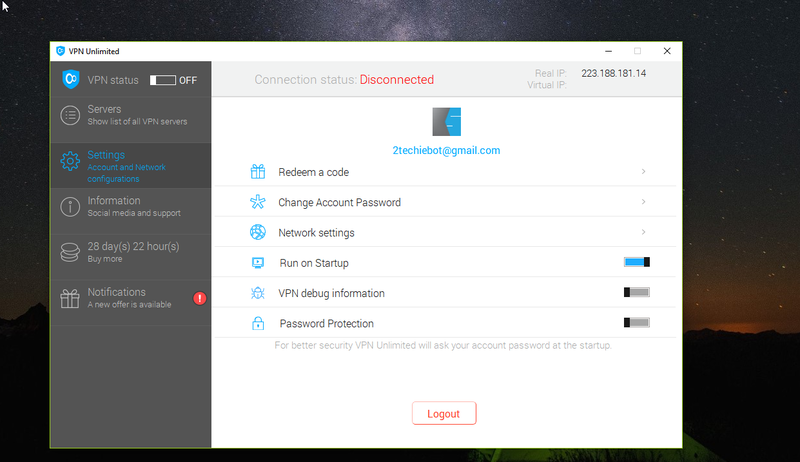 VPN Unlimited features a simple and cleanly laid out interface that delights. Connecting to the VPN is as simple as turning the toggle switch on the top left on. You could choose an appropriate server from the ‘Servers’ tab on the left. There is also an optimal server to choose from based on the prevailing network conditions. The software will show you your real and virtual IPs once connected. Should you wish to fine-tune the settings, head to the ‘Settings’ section, where you’ll be able to change the account password, run the VPN on startup and enable password protection. We recommend selecting the option for running the VPN on startup if you tend to forget activating the VPN first thing after booting your system. This is a great way to ensure your real IP is not leaked before the VPN connection is even established. You will also be able to choose the VPN protocol. We highly recommend choosing OpenVPN over the others. You might also select UDP, TCP or IKEv2 based on your personal preference. Make sure the ‘Stop DNS Leak’ option is turned on. VPN Unlimited has 400+ servers in 70 locations around the world. Our Score: 8/10. VPN Unlimited supports as many as 400+ servers located at around 70 sites around the world. VPN Unlimited does not have the largest servers network amidst all VPNs but certainly has a pretty decent number of active VPN servers. It is important to note, of course, that when it comes to VPN, having a small number of well-optimized servers is always better than possessing a large number of poorly-configured servers. The choice of servers is an extremely critical one, for, this has an important bearing on the speed of the network. It is highly recommended to connect to the server closest to you for the best overall performance. The choice of the jurisdiction is also an important one. VPN Unlimited is based in the US, which means that mandates from the US governments might require software to reveal all data they store. This is not ideal for someone really trying to protecting their identity online. Many VPN providers choose to locate their servers in more privacy-friendly countries, which greatly adds to their privacy. VPNs, undoubtedly are all about privacy. This, therefore, becomes an important point to consider when you’re out VPN shopping. VPN Unlimited performs moderately in speed test results. Our Score: 8/10. VPN Unlimited takes a middle spot in our speed tests with neither a brilliant performance removing speed throttling nor a slow performance like some of its peers out there. It should be noted that speed tests depend on the prevailing network conditions, which are often unstable and keep fluctuating. Speed test results must thus be seen in this light as a useful guide to VPN performance and not as the final word. That said, the following are the speed test results. We first begin with the baseline tests, the results of which are indicated below. As you can see, the network is clearly struggling. Let’s turn the VPN on and switch to a non-US server. Here are the test results. You’ll note that the speed has decreased a bit. Let’s now switch to a US server and see the difference. 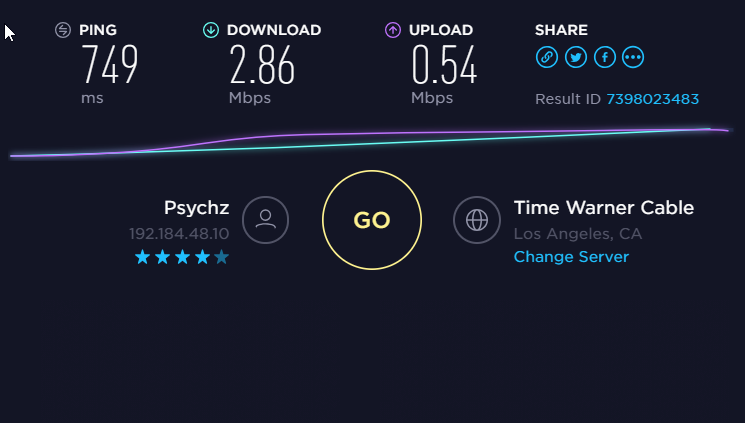 The speed is higher but still scores lower in comparison to the baseline speeds, since the entire traffic is being routed through an external server. Overall, the speed tests paint a moderately balanced picture. The speed profiles are not very impressive but they aren’t disappointed at any cost either. We’ve seen faster VPN but we’ve seen much slower VPN too! VPN Unlimited is focused on user privacy. Private IP and server features add value to the product. Our Score: 8/10. VPN Unlimited has all basic security and privacy features commonly found in other VPNs. The tool also provides for two great features, which include Private IP and Private server. Under the former, the user is allotted a private IP of his own, which is more secure rather than several VPN users sharing the same IP. The second entails the user having a complete VPN server entity at his disposal. This is great when you are not willing to share your server with other VPN users, for example. Personal Servers provide high bandwidths and connection speeds than otherwise possible since one can have the entire server to oneself without having to share it with the others. This is also a great way to get around cyber attacks, which are a greater threat on a shared service. A personal IP, on the other hand, provides you with a clean slate; you are no longer in possession of a black-listed IP used by others. Such customers are also provided high priority 24 x7 support, being treated as the most “valued customers of all” as the VPN Unlimited puts it across. The tool features 256-bit encryption, which is the industry standard. Users could either choose to proceed further with OpenVPN, which supports both AES 128-bit and AES 256-bit encryption or IKEv2, which uses AES up to 256-bit, Camellia 256-bit, and the ChaCha20Poly1305 encryption methods. VPN Unlimited does keep logs of the user’s session activity. 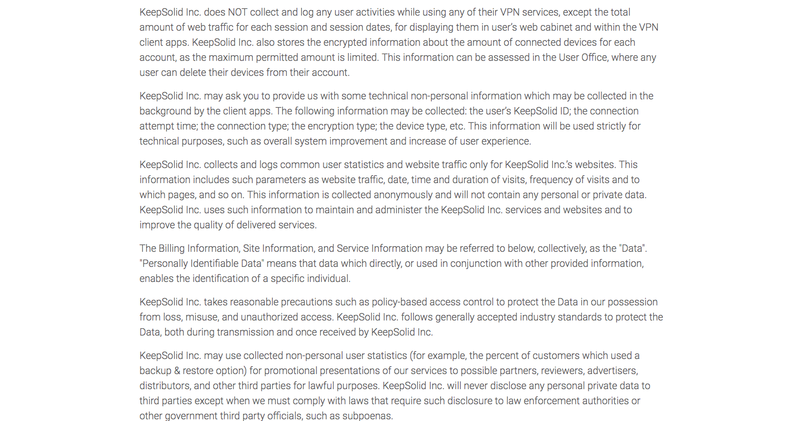 While KeepSolid, the company does not maintain any personal records of users, the software stores the amount of web traffic flowing through the app in addition to some technical, non-personal information. The VPN Unlimited describes how the session data is used for showcasing the vital connection-related information on the tool dashboard. The software also stores information about the number of connected devices on each account so as to keep the usage under check. A DNS leak occurs when a VPN accidentally leaks the user’s IP address, which defeats the purpose of using a VPN in the first place. Let’s see if VPN Unlimited passes our tests. As you can see, VPN Unlimited passes the test and does not leak any DNS data. VPN Unlimited has a dedicated online support channel. Our Score: 6/10. VPN Unlimited has multiple support channels and the customer service response times are indeed remarkable. Users could either use the contact form or send a query to the email addresses mentioned. 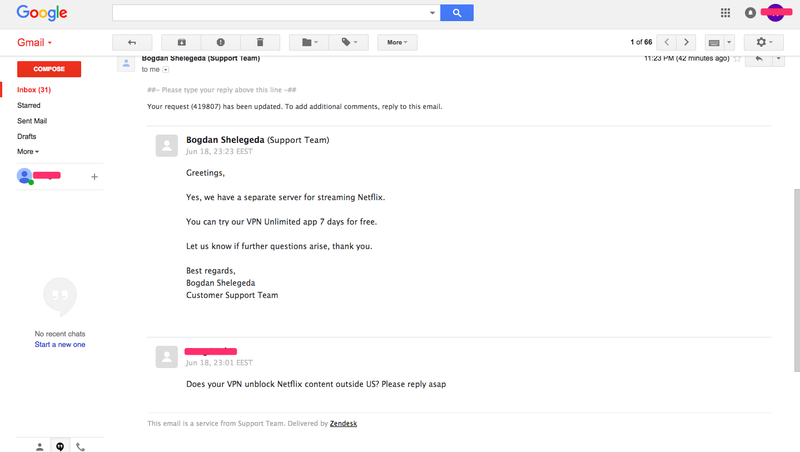 To test their response time, we contacted VPN Unlimited support and received their response just minutes later. VPN Unlimited has three main pricing plans to choose from. Our Score: 8/10. When it comes to pricing plans, VPN Unlimited has 3 main pricing plans to choose from, which are priced moderately considering the market rates. Let’s see the pricing plans in greater detail. As you can see, the monthly plan is the most expensive. However, we highly recommend choosing the monthly plan over either the yearly or the lifetime plan because VPNs operate in a very sensitive space where things quickly change. If your sole purpose of using a VPN is to be able to unblock geo-restricted content, for instance, you might find that a functional server suddenly stops working the very next day. Personal server and IP plans cost more, though. You end up spending around $21.99 monthly for 1 TB data, $35.99 for 2 TB, and $49.99 for 3TB data. The yearly and lifetime packages are much lower but if you have to use the personal IP and server plans, we recommend you choose the monthly plans for reasons described earlier. VPN Unlimited is a great tool for both beginners and advanced users though the latter might find several advanced utilities and functions missing. Who Should Use This VPN? Linux users; Those seeking an easy to use and multi-OS VPN which is moderately priced and has unique privacy features such as personal IP and server. Who Should Not Use This VPN? Those seeking deep levels of customization and many advanced features. The session logging policy might also come as a disappointment to some. Final Score: 8.3 of out 10! If you’ve made up your mind to purchase VPN Unlimited, head straight to the official VPN Unlimited website and buy your subscription today. VPN Unlimited supports a variety of different OS platforms, which is the main driving force behind its versatility. Most other VPN tools wither only offer apps for the most popular OS or support single OS apps. VPN Unlimited, on the other hand, takes a different approach altogether and serves as a universal VPN in the real sense. No matter which device you use, there’s bound to be a version of VPN Unlimited that could be installed on the OS. The software lacks deep levels of customization and some advanced features often found in its peers but it is easy to set up and use. The tool performs moderately in speed tests and is easy to set up on any device. The only thing that should concern users a bit about VPN Unlimited is its zero-logging policy, which isn’t actually a ‘zero-log’ policy really, for, the tool will log your session data as described in the preceding sections. The choice of jurisdiction is also an important concern with VPN Unlimited being based in the US, not the best choice for an app such as a VPN. 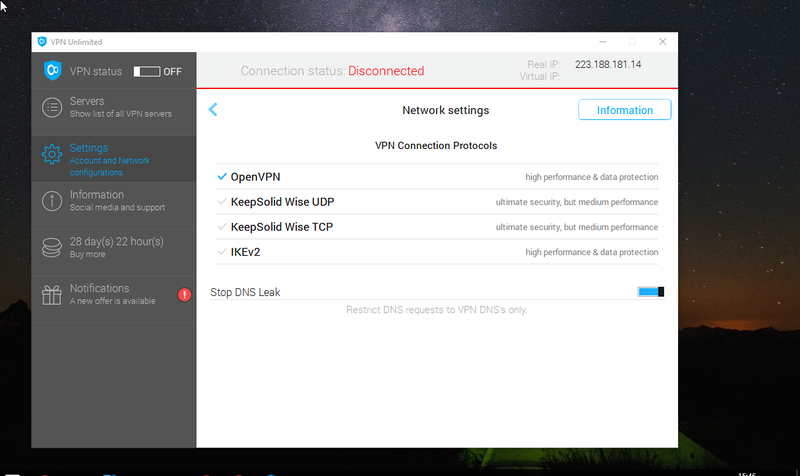 With this, we conclude our review of VPN Unlimited, which is based on our extensive tests of this software. We sincerely hope you’ve found this review useful and that it will help you decide if this indeed is the perfect VPN for all your devices. Please feel free to leave us a comment and share this article in your social media to raise awareness amongst your friends and family. VPN Unlimited is a multi-OS VPN that supports a variety of OS platforms without a problem. A must-have for Linux users!